I was in school right at the tail end of these, but I DO remember them! These days, if I were to tell my boys about "Air Raid Drills" in elementary schools, they are likely to look at me as though I'm speaking a foreign language. Now, granted, they did go through times when there were threats in schools, or news stories of threats (random people with automatic and other weapons). And yes, those are terrible things... although I don't know of schools having drills for this, some schools do have a "lock down" plan in place, and many schools in urban areas do have scanners that everyone entering the school has to go through to be sure they are not bringing weapons in. And this is a GOOD thing to help keep kids safer. But back in the early 1960s when I was in school (I started school a little bit young, at age 4)...I don't even know if they allow children to start school that early these days, but I did start at age 4 back then - I can remember doing these drills. I can remember being 5 in kindergarten, and 6 in first grade and having "drills" where a siren would sound, and we would have to "duck and cover." One day at work we were in the lunch room talking about the "Air Raid Drills" that used to take place in schools and we got some blank stares from the younger ones who were in the lunch room with us! Today's kids wouldn't have a clue about the paralyzing fear that came along with these drills. This was in the days at the height of the cold war. Nuclear bombs were being used to put fear into people, and there was a race going on to see who could stockpile the most bombs. At the time, this was thought to be the way that we would "protect" ourselves, and retaliate if attacked. We were shown a film in school called "Duck and Cover." And along with it came a handy-dandy little comic book. We can look back now and think how absurd it was, but back then, I think it was just the adults truly believing they were doing the best thing. It was to educate kids on how to protect themselves, should a nuclear blast take place near their school or home. I think it accomplished more than that. I have heard of kids who had nightmares back then. But then, with all the news coverage we have today going on 24/7, people these days have nightmares, too for different reasons! When seen in the context of the times, in 1949, the Russians had blockaded Berlin and were pushing their way into Poland and Eastern Europe. Their plan was to turn other nations into communist regimes, and in August of 1949, they were in a joyous frenzy when they announced that they had detonated their first nuclear bomb. For average Americans, this was a very real threat to their safety and security, and American's had visions of death and destruction coming onto our soil! 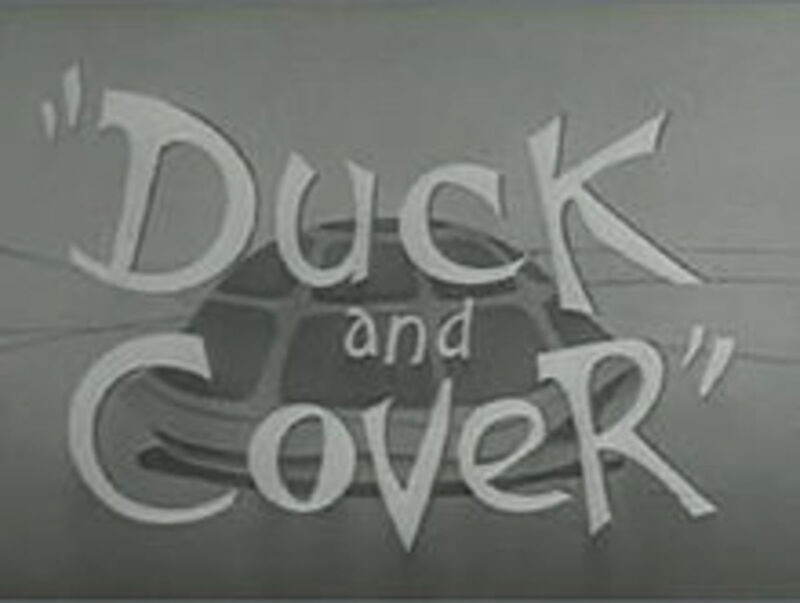 A cartoon used to educate children to "Duck And Cover' in the event of a nuclear bomb explosion. 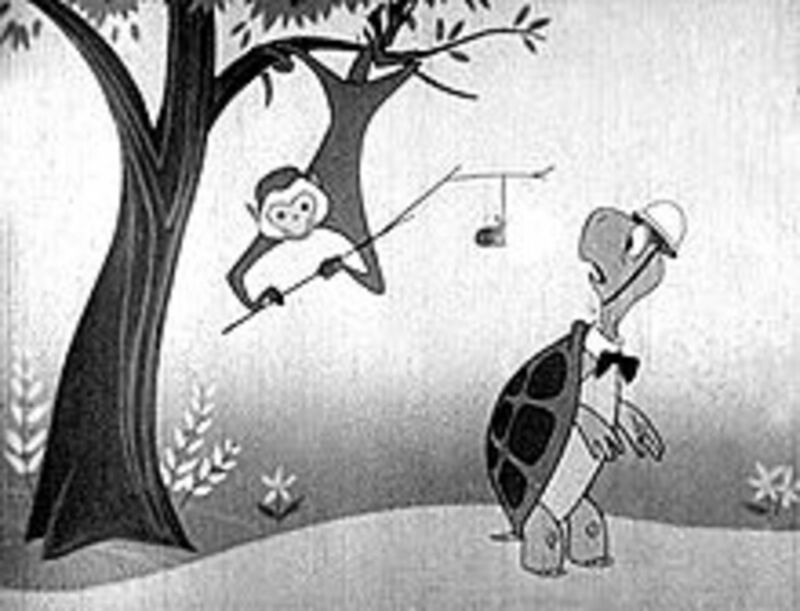 Almost humorous in the way that a cartoon turtle and monkey were used! A bit simplistic, but the people behind it meant well. 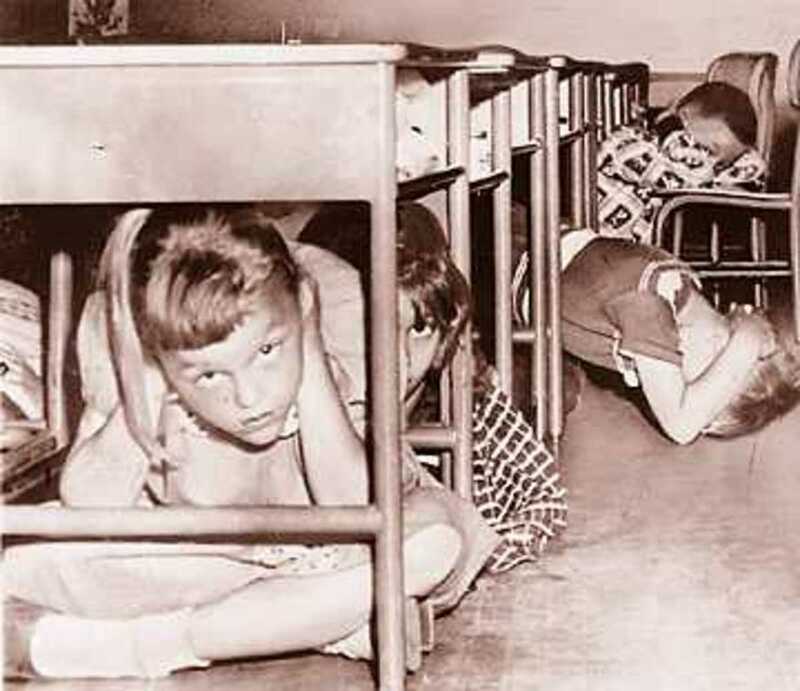 Under desks was one place to duck and cover. If you couldn't get under something, you were to duck away from windows, up against and inside wall, and cover the back of your neck and face to keep from getting burned by the radiation. 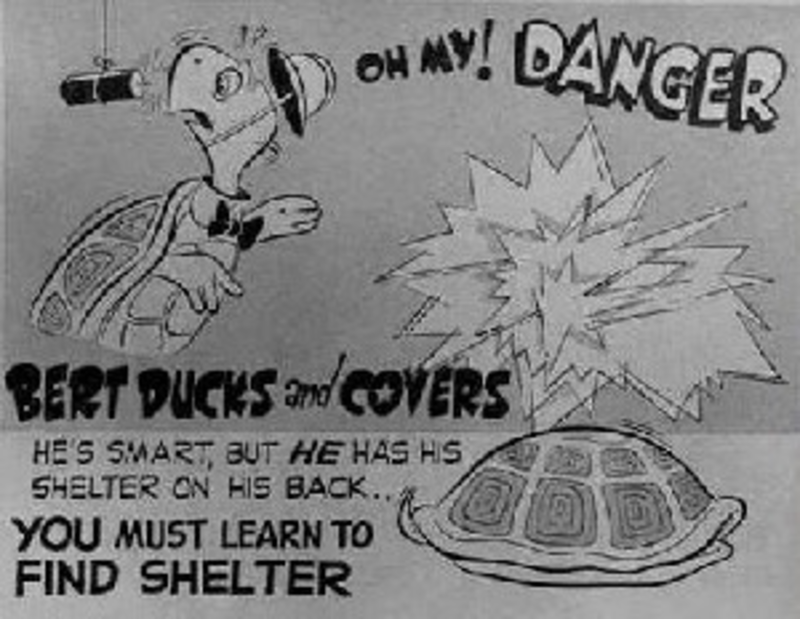 There Was A Film We Watched In School Called "Duck And Cover"
A film called "Duck and Cover" featured a cartoon turtle, and was made to lull kids into a false security - when you see the bright light of the bomb, simply duck underneath a desk or other hard object, or duck facing away from windows, and cover to protect yourself from flying debris and burns from the nuclear blast. The way we talked about it in the lunch room that day, one guy said "what it REALLY meant is to duck, bend down and kiss your b*tt good-bye"... now he meant this in a joking way, but with the information that we have today about the dangers of nuclear radiation, he really did have a point! A warning siren would sound, and you were to immediately, in an organized fashion, take cover "Duck and cover" as it were. If you were outdoors on the playground (and this is where I remember having to do these drills), you were to line up in an orderly line and shuffle single file into the fallout (bomb) shelter. By the time we'd get everyone in, we would have all been "glowing in the dark". But I guess it lulled people into thinking that they were being proactive and doing something. In 1953, things got worse when Russia exploded it's first hydrogen bomb. Kids would have reactions ranging from terror and nightmares, to plain boredom from being made to do these drills. I can remember doing one about every two weeks. I can remember hoping that it WAS indeed "just a drill" and not the real thing. 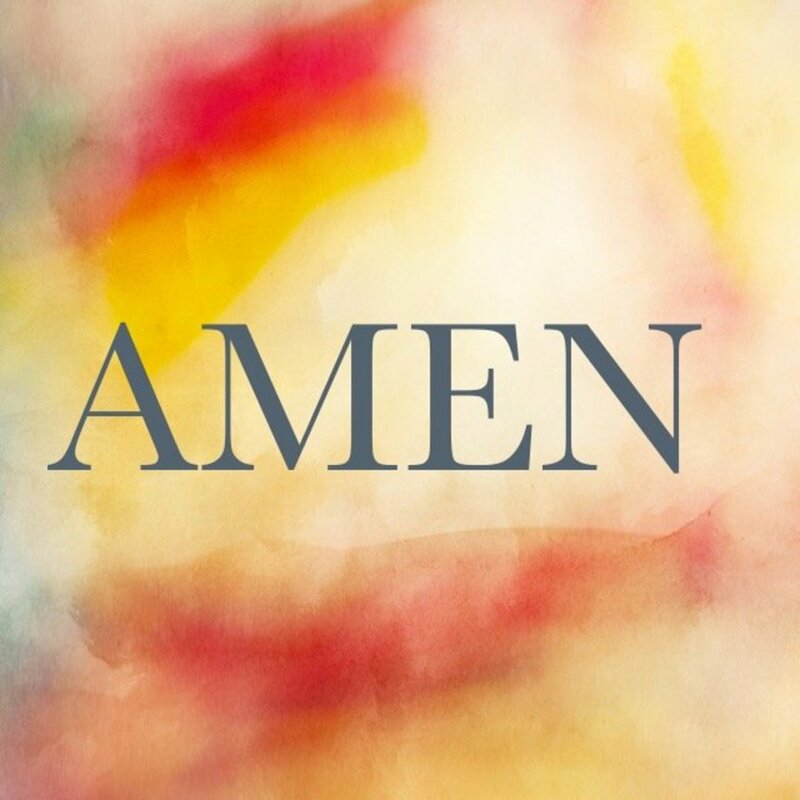 Teachers would sometimes lead the kids in prayers and comforting songs... which would totally be frowned upon today, but back then it was a normal thing to do. No wonder many of these kids who participated in these drills grew up to protest war as young adults! Government eventually began to see the foolishness in these drills, even though they were well-intended (trying to teach kids how to survive something that almost surely would not be survivable), and the drills were stopped in many places in the early 1960s. But where I went to school at the time, in the Midwest, they continued at least until 1965. Anti war protesters thought things like this film were "terrible" and a way of "brainwashing" young people into believing that we needed to solve problems like this by pushing back and fighting. Their voices were partly instrumental in stopping the drills in the mid 1960s. I'm just thankful that today's kids don't have to go through drills like this, although I know the feeling they must get every time they hear of another school shooting... it looks as though every generation will have their own memories, I just pray that in the future, those memories will be of the achievement of peace in their lifetime.... we can only hope! I certainly remember them. Plus there were sirens throughout the city. It's a remembered loud sound at the same time on a schedule. I remember we were brought down to the lowest level of the school and had to duck down there against the wall. These drills did happen in the mid to late 1960s, so you’re right ! Thank you for commenting! I started going to school, (first grade, no kg) in 1941 in Ohio. (Wayne Township High School) I graduated from Monroe High School in 1953. The drills you speak of must have happened some time after 1953. I think one reason I remembered these so well is because they were scary, Granma Mish! Thanks so much for sharing your experience! Living in Wisconsin, I didn't know too many people from other parts of the country- it's interesting to hear these stories from others! Thank you so much for commenting! I went to school in the 50's and 60's in NJ. I can remember the air raid drills when the sirens went off suddenly, and we would file out to the hallways and cover our heads. During the Cuban Missle Crisis, someone in their infinite wisdom decided to have an air raid drill! The entire junior high panicked! That was the very last time the school pulled an unannounced drill of any sort! That's what we did too, Jerry! Thank you so much for sharing your experience! I started elementary school in 1960 in Corpus Christi, Texas, which was a "hot spot" for attack during the Cuban missle crisis due to the Naval Air Station and several radar tracking stations throughout the city. 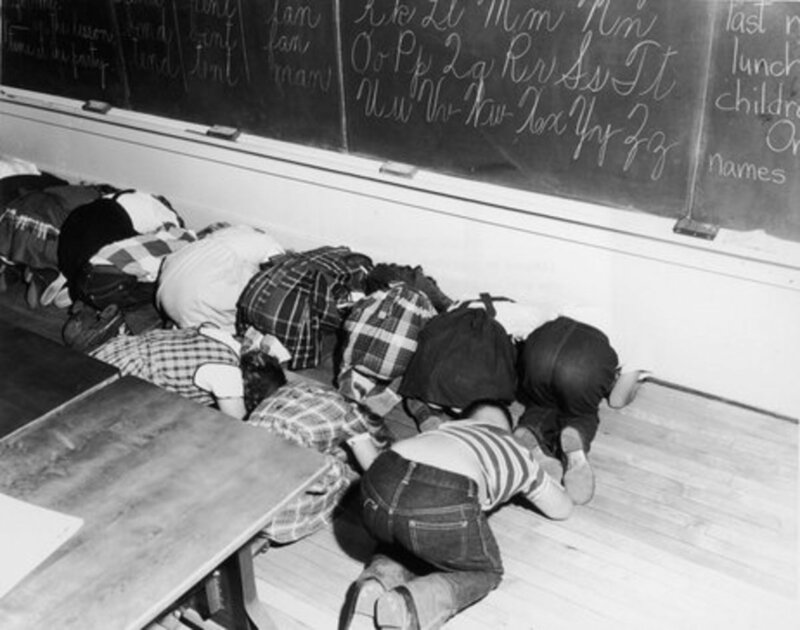 We had several air raid drills for the next two or three years which were duck and cover, and I remember the siren mounted on a tall wood structure next to the playground. Even as youngsters, we used to joke about how we were toast if there was an attack! I was in elementary school in the 70s in a suburb of Los Angeles and I can clearly remember the eerie sound of the air raid drills. I recall them happening about once a month and all the kids had to crawl under their desks and cover their heads. I can't remember when they stopped, but I don't remember them happening when I was in junior high in the late 70s to early 80s. Thanks for your comment, Matt! I didn't realize there were still places doing this in the 1980's. We were doing this in the early 80's still. Forgot all about the fallout shelters. Never had the chance to see inside one. I can't imagine the fear kids must feel today, Jonnfri. Especially in light of the recent news stories like the one from the Sandy Hook elementary school. The world can be a scary place at times. Thanks so much for sharing your story. I ate lunch at school with my daughter today, first time :) We were talking about fire drilles, and tornadoe drills. I remembered how great they were because you got a little break! Then she mentioned Duck and cover, and lockdown! It was very very hard to keep a straight face and not cry when I thought of the fear that would be going through every one! I would have NO PROBLEM if they all said the lords prayer during these drill infact I would encourage it! Especialy after her little friend said there is not enough room for the whole lass to fit under the teachers desk! It was a very bitter sweet smack of reality! I remember this! Our school basement was a designated Fall Out Shelter, and sometimes we practiced marching down to the basement. When I was in 1st grade there was a mass murderer on the run. We were all sent home early, and told not to dawdle. 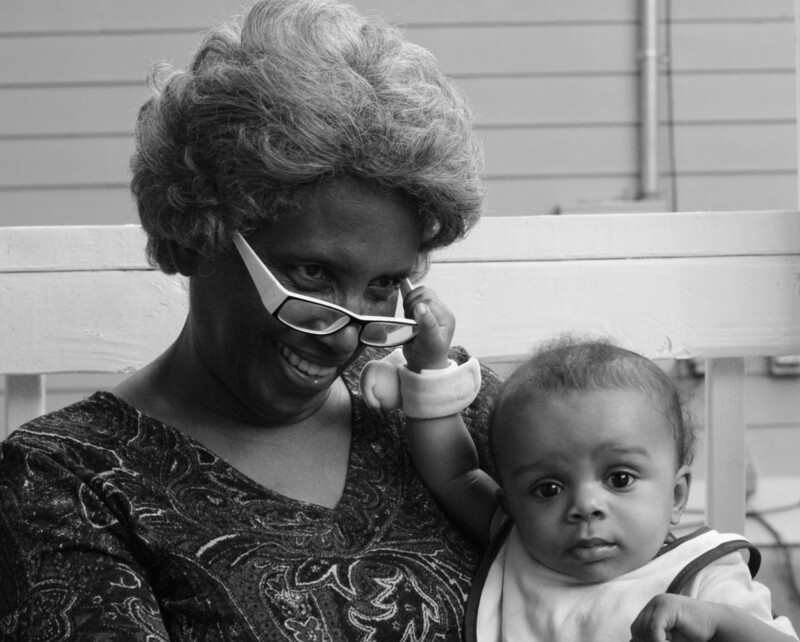 My mother was a 1950s rarity - a working mother - and she wasn't at home. She was furious with the school, and complained to the principal. I grew up in Philly and air raid drills were called Retention Drills. We did not duck and cover. Instead we would quietly line up, leave the room and stand/sit in the hallway, away from and windows and/or doors. i would say these Retention drills ended by 1959. Wow, teachertalking1, that must be scary as well. I guess each generation has their own threats to deal with and to be concerned about, depending on what is going on in society at the time. Thanks for sharing and for stopping by! :) I appreciate it very much! I never experienced the duck-and-cover drills that you speak of - I can only imagine how terrifying that must have been for you as a small child. I teach in a school that has regular code yellow and code red drills. The principal can call a code yellow if there is moderate danger such as something going on in the surrounding community. A code red will be called if there is an armed person near our school or for any other reason where our students' safety may be in jeopardy. Unfortunately we usually have at least one or two real codes each year and they are always scary for the staff as well as the students. Yes Kathy I do remember having to duck under the desk and having those air raid drills. I had forgotten about them until I read this hub. Thanks for sharing it. Good hub KathyH,I remember all of that well.We had a place in our basement too,although it would have done no good,but just left us to suffer longer. Some people refused to do anything and announced that they would walk hand in hand into the horizon. Not only the 50's were bad for this.During the war we would have air raid warnings regularly where the whole city had to shut the lights out. Some people,I remember, would cheat and hang a blanket over the windows so no light would show. I have never seen that video and hope my children didn't see it. Too too scary for children. I don't remember these but I have heard my mom talk about them! She remembers them vividly! Thanks - great hub! nope. don't remember them. lots of bomb threats and fire drills but truly i don't remember air raid drills in school. only the sirens for all the city. that scared the bejeebuz out of the adults. I don't know if my parents (I doubt it) or a relative made me much more aware than you two ladies seemed to have been but I was acutely aware of the what the sirens signified. I was always so afraid of my pets dieing without me being at home with them. In addition the to sirens which have left a long term scar on my psyche, I remember the personal fall out shelters that people were building. There were several movies about these and how neighbors and relatives would be scratching at the doors pleading to be let in as the missiles were on a direct path for the United States. To this day, and I am 60, hearing a simple ambulance or police siren sets off a gnawing pain in the pit of my stomach. I have no doubt that these disturbances influenced the "Live For Today" mentality of the early 60's as well. Great topic. I'll be very interested to read more comment and see what other remember. I'm going to link this on my Facebook page where more of us oldsters will see it. Well written, once again! Thanks, Stephanie! :) I felt the same way. I didn't really understand the full depth of what these drills meant. To us it was almost like fire drills, just a way to get out of class for 5 to 10 minutes... but if something had REALLY happened, I wonder if we truly would have been prepared? Kids these days seem to have more to fear than we did back then for sure! I remember the "Duck and Cover" air raid drills well! In elementary school in the 50's, we either went under our desks or out in the hallways at school. The threat of THE BOMB was there, but I don't think we kids really understood it. It wasn't as real as shootings in the schools that have happened in recent years or the 9/11 attacks that were on tv constantly for weeks. It seems that kids of every generation have something in their lives to fear. Good hub, and a realistic look at one aspect of life in the 50's. Voted up! The college that I went to in the late 1970's still had air raid shelter markers, and tunnels under the dorms that were stocked with emergency supplies. The access doors were kept locked, but it was a rite of passage to visit the tunnels. We knew what they were for and why, but couldn't imagine actually needing them. We had only 1 drill in the 1960s and some kids could not fit under their desks. However, we had permanent plaques indicating bomb shelters inside basements in downtown buildings until the 1980s, when the last few were removed. It was all a frightening period of time for many people. Thanks for the Hub!